Vacation travel need not involve endless airport security lines or stop-and-go highway traffic. Trains cannot match planes’ speed or cars’ flexibility, but they can make getting where you are going a relaxing and enjoyable part of the trip. The California Zephyr, a two-night Amtrak route between Chicago and the San Francisco Bay, is perhaps the most scenic train trip in America. It’s at its best west of Denver as the train follows the Colorado River through the stunning Byers, Gore and Glenwood canyons. Later it crosses the Sierra ­Nevada and California’s majestic redwood forests. The western terminus is across the Bay from San Francisco, but there is a connecting bus to the city. Note: You can ride between Denver and San Francisco and see most of the trip’s highlights for about two-thirds of the full journey’s price. The Coast Starlight, a one-night. ­35-hour Amtrak route between Los Angeles and Seattle, is the only Amtrak train that still features a parlour car—a comfortable space providing overstuffed recliners and wine tastings. The ­atmosphere in a parlour car tends to be extremely social, and you even can take your meals there if you like. But the parlour car is exclusively for the use of passengers who have booked roomettes or bedrooms. The scenery is beautiful, too, with views of Puget Sound, the Cascade Range and the Pacific Ocean. The Cardinal (pictured above), a one-night Amtrak route between New York City and Chicago, does not travel a ­direct route. Instead it dips south through the mid-Atlantic states and southeastern heartland…across the beautiful Blue Ridge and Allegheny mountains…and through the Shenandoah Valley. 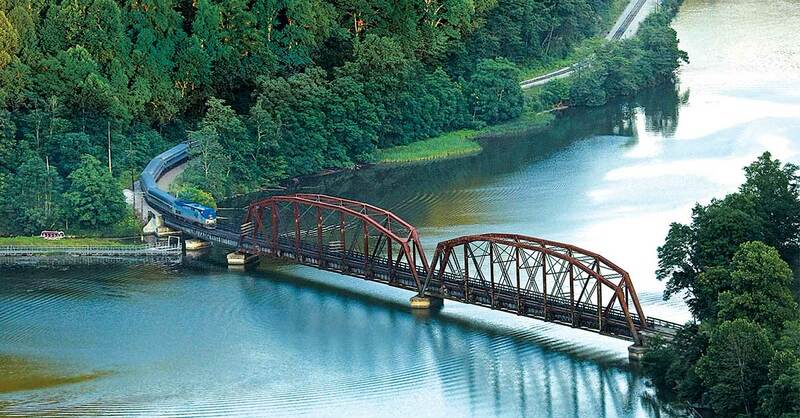 The big scenic feature of this route is the New River Gorge in West Virginia—the train follows the New River through the gorge for several hours, crossing back and forth across the river several times. The Canadian, a four-night trip between Vancouver and Toronto on Canada’s VIA Rail, is the most luxurious long-distance train trip you can take in North America. The food is outstanding…the level of staffing and service feels first class…and the train cars themselves are sleek, restored stainless steel cars from the 1950s. The route provides memorable views of Canada’s varied landscape. The spectacular Rocky Mountain crossing is the highlight, but the country’s vast farms, prairies and forests are impressive, too. 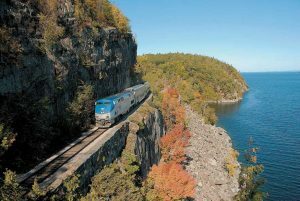 The Adirondack, a 10-hour Amtrak trip between New York City and Montreal, treats you to the lush wine country of the Hudson River Valley during the southern part of the journey, then to the dramatic and historical scenery of Fort Ticonderoga, the Adirondack Trail and Lake Champlain. The views are pretty year-round and become truly spectacular in the fall when the leaves change color. The Pacific Surfliner, a six-hour, ­single-day Amtrak route between San Luis Obispo, California, and San ­Diego, stands out for its stunning Pacific Ocean views. For the best views, get a seat on the west side of the train—that’s the right side if headed south, the left if headed north. If you’re visiting Los Angeles, the Surfliner offers a relaxing, car-free way to pop down to San Diego or up to San Luis Obispo. (These half-route trips each take around three hours.) The train has special racks for surfboards and bikes, reservations required. The Durango & Silverton Railroad uses old-fashioned steam engines to slowly traverse 45 miles of narrow-gauge rail line through the breathtaking mountains of southwestern Colorado’s San Juan National Forest. The route travels along shelves blasted into mountainsides and across bridges over wild mountain streams—it is among the most scenic train trips in the country. The trip takes three-and-a-half hours each way and is offered from early May through late October (shorter trips are available in the off-season). There’s a two-hour layover in Silverton, a tiny former silver-mining town. 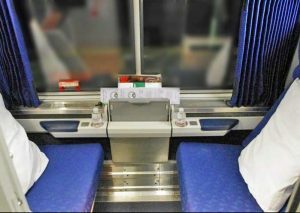 Amtrak travelers on overnight routes can sleep in coach seats, just as travelers do on red-eye airline flights, but roomettes and bedrooms also are likely to be available at a higher price. Each person in a roomette or bedroom pays a basic rail fare (the cost of a coach seat), but there is only one supplementary charge for the room regardless of whether it is­ occupied by one or two people (or three or four people in the case of a family bedroom, which accommodates two adults and two children). The supplementary fare for the room covers dining car meals for all occupants. A roomette is a compact private cabin for up to two travelers. Its seats convert into a bed, and a second berth folds down from above. Some travelers find the upper berths in roomettes claustrophobic, and both sleeping spaces are too small for most couples to comfortably share. Some roomettes have a private toilet and wash basin. Many Amtrak overnight routes also offer bedrooms, which feature larger berths as well as private toilets and showers…and/or “family bedrooms,” which include two adult-size berths plus two shorter berths for children but no private shower or toilet. Either of these bedroom options is likely to be at least twice as expensive as a roomette. *All routes mentioned in this article are one-way trips that can be taken in either direction, except as noted. Amtrak fares fluctuate based on demand, so prices might differ from the prices cited here. Travelers age 62 and over qualify for a 15% discount on many, though not all, Amtrak coach seat fares. You do not have to travel the entire distance on routes via Amtrak and Canada’s VIA Rail.